We like making our own flour mixes in our kitchen. But we’re weird. I don’t mind the flour flying onto my black pants as I measure it out onto a bowl balanced on a scale. I like playing with new flour combinations every week — maybe we should go back to sorghum? I feel like a bit of a mad scientist when I mix almond flour and buckwheat, millet and sweet rice. This crazy process is something I truly enjoy. But I can’t imagine everyone likes doing this or has the time. After all, making food in our kitchen is what we do for a living. And now that we have two kids instead of just one, I understand even more keenly why people might not want to spend part of their Sunday afternoon mixing flours into a cambro and giving it a big shake. It makes sense that the more occasional baker would just like to buy a mix of flours. We’ve tried all the gluten-free flour mixes on the market, and one of our absolute favorites is Better Batter. We’re happy to announce Better Batter as our latest sponsor. 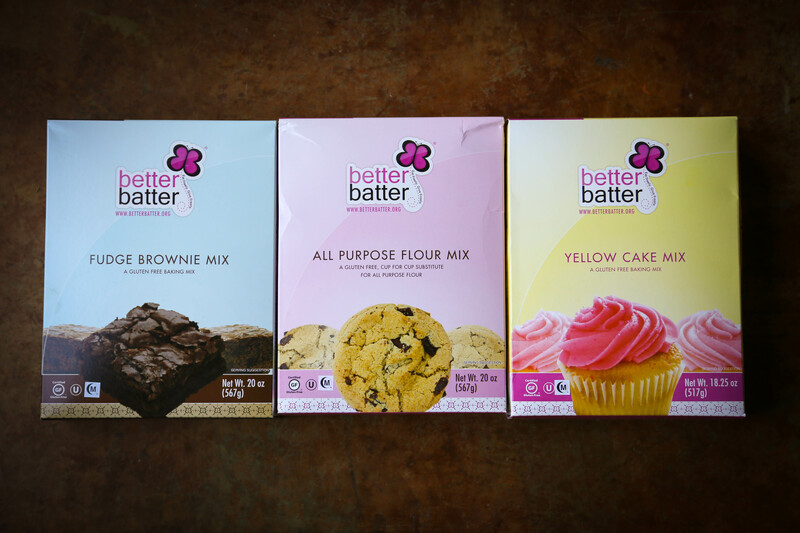 Better Batter is intended to be a cup-for-cup replacement for wheat flour. It’s not a whole-grain or high-protein flour mix. Instead, it helps you to make your grandmother’s chocolate chip cookies, gluten-free. This all-purpose flour mix works well for making pies, cookies, cakes, muffins, and quick breads. If you need to be gluten-free, but you don’t love to bake and play mad scientist in the kitchen making up new recipes? We think you would love the Better Batter all-purpose gluten-free flour . Their seasoned flour mix is great for making fried chicken and fish, onion rings, or anything you wanted battered before you fry it. The Better Batter pancake and biscuit mix makes Lucy’s favorite pancakes of the moment. The Better Batter brownie mix makes fudgy, lovely brownie mix. And the Better Batter yellow cake mix and Better Batter chocolate cake mix make fluffy, moist cakes. If you have a gluten-free birthday party coming up, or you want to make a batch of cupcakes so your kid doesn’t feel left out at birthday celebrations, these are truly wonderful. These are, in our opinion, some of the best gluten-free flour mixes on the market today. We encourage you to click those links and buy some Better Batter through Amazon, which is the best way to find them. We also wanted you to hear more from our sponsors. Their story is part of the reason we love this company. What compelled you to create Better Batter? We began our gluten-free journey because my child was dying – literally. Teeth loose, bowels even looser, shedding intestinal tissue – he was a mess and a half! I was 100% committed to giving him a normal diet, and so I began to look for gluten free alternatives. When my younger son and I were also diagnosed with celiac… and then my sisters and father (! )… I knew gluten free would be a permanent part of my cooking. Back then, there weren’t any gluten free products consistently available (2003) and the recipes that were out there just weren’t great (boy have things come a long way!!) and even more than that I couldn’t make the foods my family made. My dad is a retired executive chef, as is my granddad, so that was seriously traumatic. I was tired of making “other people’s food” – I wanted to make MY mom’s pie, not someone else’s. Better Batter itself (the flour) was dreamed up, on a night after I quite sincerely cast up a prayer to heaven to have some kind of solution to my problem, so I can’t take much credit for the initial creation of the product, except to say it’s been a literal God-send, but the urge to help other people to live a normal life and the urge to give charitably is what compelled me to create Better Batter (the company) and what continues to compel me to create new products. Why do you think Better Batter works as a gluten-free flour mix? Well, as you have told your readers many many times, it’s about getting the mix of starches, binders, proteins etc into the right combination. I call these bodifiers, modifiers, starches, and binders, and we have a combination that is similar enough to real gluteny flour to work in real gluteny recipes, when measured properly. Can you tell us the story of a customer(s) pleased by Better Batter? Sure! We have a customer who has a child with both celiac disease and autism. They were really struggling because their son was extremely self limiting in what he would eat. At the time, he was only eating a popular orange powder brand Mac-n-Cheese and breaded chicken fingers. She was at her wit’s end, because the sensory issues that come with autism made it next to impossible for her to feed him alternatives. She came to us to ask for help, and fortunately, I was able to be there for her in a very real way because my older son (who also has autism) was very self limiting, at first, too. We decided to switch to a great brand of gluten free pasta elbows and use the powdered cheese from the company and to make homemade chicken fingers using our flour. It worked! She couldn’t believe he would actually eat the alternative, and I explained that if the taste and texture is perfect – and it has to be perfect – you *can* make substitutions. Fast forward a few weeks: Her son randomly grabbed strawberries from the table and tried a bite. The next day, he grabbed some breakfast cereal (also gluten free). And the food list started to expand for him. As his body healed, his ability to tolerate different foods increased. As a result of better nutrition, he grew a great deal (about 8 inches) and his neurological function improved dramatically, to where he became very high functioning. He was able to communicate enough to help her realize that he loved playing the piano, and now he’s pursuing that with passion. Sort of a long, roundabout story – I guess she’s happy with our product because it gave her hope and her son a chance to have a healthy, productive future. Those types of people, and those stories are what keep me doing this and why we sell our products. What do you hope Better Batter brings to people’s lives? I want our products to give people their lives back – their recipes, their memories. I want people to be able to bless their gluten-free relatives without having to relearn everything they know about cooking. I want gluten free folks to feel normal, for their kids to be able to have what all the other kids have. I want holidays to be less stressful, for menus to satisfy the whole family, and for budgets to reflect real savings. I want a world where to eat gluten free isn’t to feel weird or different or to have to accept mediocrity. I want our company to give people life to the fullest. I want people with autism to have therapies they need and advocacy when they need it. I want the poor, the orphans, the widows, and the oppressed to have justice, clean water, good food, shelter, and education. I want to change the lives of people who don’t have the means to change their circumstances. Most of all, I want people to partner with us as we pursue this dream, because I want them to experience how rewarding it feels to leave a legacy for future generations. The good folks at Better Batter would like to offer a sampler pack — one of every mix they make — to two readers of this site. Please leave a comment here about why you would like to win one of these sampler packs. Comments will be closed after Sunday, May 18th. Winners will be chosen at random and notified by email, so please leave a working email address with your comment. I am fairly new to celiac and GF eating, having been diagnosed around Christmas after about six years of symptoms. I’m trying hard and doing well…but must say that my baking has taken a huge hit. Better Batter products come highly recommended, and being able to experiment and try them would be so wonderful! To top it off, shortly after being diagnosed with celiac, I was also diagnosed with melanoma and had to have surgery on my cheek, leaving a 3″ scar. Getting a sampler of fun GF products would bring some cheer to a long few months! Oh how I would love to try those fudge brownies. I haven’t had one in ages. My sister loves to bake but she bakes from a Costco box and I can’t eat. Im the biggest baker and my last name is baker. I would love to test these products out! I get soo excited everytime i find a product that works well. Plz choose me! I’ve never seen these products before but would love to try them from what I’ve read about them. I’ve started using the flour to bake with and am excited to see there is now a brownie mix. I can’t wait to try it! Love Better Batter’s all purpose flour. Would love to try the other mixes. This has made life so much easier for my son. My one year old was diagnosed with celiac’s about a month ago. We are still learning about gluten free baking and cooking and trying products to see what we like best. We would love a chance to try the sample pack! New here. My 4 year old will likely benefit from going gluten-free. Overwhelmed by the task ahead of me. If it’s good for her, it’s good for ALL of us. Cooking is no problem – I’d much rather cook than buy the prepared foods. My daughter like to help cook too, so this will keep that alive in our home. This would be an excellent start to my/our gluten free journey. Would love to try them all!!!! Can’t wait to try these with my 4 year old! I am a little intimidated to get into putting together my own flour mixes..my mother has become a wonder at it though! I would love to find an all-purpose mix that I could use myself to go back to the competent baker I used to be before I went gluten-free:) Thanks for letting us know about this company! I will definitely try them out even if I don’t win. Finding great gf products can be hit or miss….would love to try a “hit”! Would love to try these!! I am always on the lookout for new & better treats! Thanks for the heads up. I want to make gluten free pasta. I have had celiac for the past few years,both my mom and my daughter have been diagnosed with it also. Winning your flour and mixes would be quite helpful,since we are living on a fixed income. Thank you. While I do mix my own using your original AP recipe, which I love for pancakes, corn breads, and other heavy foods, I would like to try a premix like better batter for lighter AP for cakes and more delicate desserts. Hello. I am new to gluten free. After years of stomach and intestinal pain and countless labs and testings I decided earlier this year to go on an elimination diet. Low and behold I am gluten sensitive. Gluten free for me is a life choice. Knowing what I know now I feel guilty when I watch people consume gluten. I recently started up a BBQ and catering business and one of my main marketing strategies is to convert all of my menu items over to gluten free options. From cornbread to apple cobbler. I am an avid baker and am struggling with my confidence in this new found life style. It would be amazing to win a collection of your product in hopes that I would find a product that is trust worthy and marketable. Please and thank you for your consideration. Thank you for helping us with Celiac to enjoy our favorites again! I would one to try this product. I am currently using Cup 4 Cup and not that impressed with it. As a full-time working mom, mixes like these are essential to my weekly meals and I would love the opportunity to try them. My daughter has had some skin issues since she was about 9 months. After going to doctors for over 4 years, one finally suggested cutting out gluten to see if it helps. I’d love to try your products since this is all new to me and I think it’d help in making the transition. Thanks so much! I love your website and I would love to try anything new you recommend! I’ve been gluten-free for almost 5 years now and this website is, by far, the best resource that I’ve ever stumbled upon. In fact, I just bought one of your cookbooks off of Amazon today! Woohoo! I would love to try this flour! I am going gluten free while breastfeeding my son who has multiple food intolerances, would love to try these. In Canada, we have very limited resources for good gluten free products, and I often find myself buying items we love by the case from the US now that my husband AND daughter are gluten free. They are both finding their way back to health, thanks to a wheat sensitivity diagnosis and the large amounts of time I spend in the kitchen cooking for them! I do usually mix my own flours, but sometimes it’s a nice break to be able to open a mix we love and know is going to turn out! I have yet to try these mixes but I’d love to. I would love to win because my daughter and I have celiac, so we would definitely put this to good use! I was diagnosed with celiac 2+years ago and instantly got rid of all gluten in my diet. The only problem is I love to bake and have spent lots of money on all the different flours and binders, etc, etc! I would LOVE to try this product, esp something so highly recommended…thanks for your beautiful website! I would love a sampler pack of your products. My teenage daughter has only been gluten free for a few months and it has been a little bit of a struggle. So much to learn! I love to bake & have tried some gf boxed mixes and we have not tried anything tasty yet. Can’t wait to try out your products. (without a taste test!) to make something for them when they come. They are both bakers and know the good stuff. I’ve been reading a lot and I think yours would be something that they truly would appreciate. I’m so thrilled to see another gluten-free products company that is so well-reviewed. It’s so tricky and frustrating to trial new products, that’s it a godsend to hear such positive reviews. I would love to try their products. I love your story and your idea of legacy. The legacy I’d like to leave my children and grandchildren is one of love, sharing, loaves and fishes. To be able to share food I can eat with them and have them see it as “normal” would be a blessing…and baking together, always an adventure, could take on a simplicity once more. I would love to try your products. Thanks for what you do! Love this flour! It makes the best pie dough! I was diagnosed with hashimotos seven years ago after suffering through infertility and coping with strong symptoms associated with a thyroid problem. I have recently hit a bump in my journey and the same symptoms have returned after years of being in control. There are so many success stories with gluten free diets with hashimotos that I am trying to make the switch. It’s hard and I’m still learning. I would love to try these! We use Better Batter for as our all-purpose mix, and love it! Buy it in the 25lb bags because we use so much! Works really well in most recipes as a 1:1 replacement. Definitely one I would recommend! Oh, I would love to win because I am the person you wrote about. I do not enjoy experimenting in the kitchen! I am an eat to live person whose choices are narrow since discovering a life altering gluten intolerance. Thank you for what you do. I truly appreciate your trying these products and providing feedback. I’m always in the lookout for new products. I love Cup 4 Cup but it is soooo expensive and would like to find an alternative. My family especially my mother has had problems with their stomachs and intestines for years. I guess we just always just lived with it. Has I getting older I have been noticing the problem getting worse. All my research leads me to gluten and have been feeling great since deleting it. Now I would like to had some baked goods back to my diet and would love to try you products thanks. I’m make my own flour mix too. I’ve only tried one pre-made gluten free mix and that was Bob’s Red Mill which includes garbanzo bean flour. Yuck! Since then, I’ve made my own because it’s cheaper and I like being able to play around. It would be nice though, to have some pre-made mixes on hand for those times when I just don’t feel like taking the time to refill my flour container. I would LOVE to try these Better Batter mixes! My 2 year old and I are gluten free. Working full time and taking care of a 2 year old doesn’t leave much time for the kitchen. Having these mixes on hand would help immensely. Always game to try a mix GF flour mix! Since finding out our five year old must be on a strict gluten free diet, and having found pre-made gluten free baked goods to be, for the most part, bordering on inedible, I have spent countless hours trying to recreate everything I used to bake. I would dearly love the chance to sample your mixes in the hope of finding…well….hope! I’d love to try these mixes for myself, my family, and friends who are new to navigating gluten free. I was diagnosed with celiac back in 2006. I’m an avid home cook (chef in a past life) and love to bake for (and with) my kids. My daughter Olivia was tested when she was 2 and showed no signs of being celiac, but recently (she’s 4.5) she’s complained of stomach aches, headaches, gas, and diarrhea. I would love the opportunity to try the better batter line of products and do some baking with her! My daughter has celiac and our whole family had gone gf, we have all struggled with stomach issues and it has helped all of us tremendously. I love better batter, it is my favorite andi have been promoting it to friends and family. I have tried the baking mix too! I would love to try all of your products. I am sure they are all as awesome as the all purpose flour. I would love try your Better Batter Mixes! Oh my goodness they look wonderful! I’m on a fixed income & just can’t afford what I should have/need since being diagnosed with Celiac Disease. I go without instead, which is ok. Thank you so much for what you do! It’s wonderful! I’ve never tried the Better Batter brand so I would love to win a sample for my 10 yr old daughter and I. Thank you for the opportunity. Well, I would just live to try your new flour mix. I have followed your website stories, read your sweet interesting books, and love your beautiful recipes. There are not a lot of decent flour mixes out there, so I would love to try this one. Yes! Just reading the reviews brings tears to my eyes! I’ve been GF for 10± years and had all but given up on finding a really good GF flour mixture that tastes great, bakes well and is versatile. I would love to try these mixes! I was diagnosed with celiac three months ago. I am slowly recovering from the decades worth of physical and mental damage, but it will take many more months, if not years. I, too have been experimenting with flour combinations, but sometimes I am just hungry NOW. I recently tried Better Batter, thanks to a gift from a very generous friend. I love it. I want so badly to try the rest of Naomi’s products, but cannot afford it. Since I live on my Social Security retirement check and nothing else and get no government assistance, my food budget is $100 a month. That doesn’t stretch to packaged foods. This wonderful offer would make a huge difference in my ability to feed myself. I am so happy that Better Batter is now a sponsor, as your blog has been my touchstone whenever I struggle with the reality of celiac. I have tried different flour mixes, but have not had a lot of success converting our family recipes. It would be great to find an alternative that is easy and provides great results !! My nephew just got a celiac diagnosis, so although I’ve read you for years and worked hard on my gf cooking for friends, things just got extra real for us. If we win, I’m taking our samples to my sister’s for a serious day of baking. I’m newly diagnosed and have been looking for a flour to substitute without having to measure out grams. Cup for cup substitute sounds wonderful! I’d love to try it! I would love to try Better Batter, especially the pancake mix! I’m newly gluten free and my husband just wants to make good pancakes for us, but has yet to feel comfortable with serious experimentation. Having a diagnosis of Gluten Intolerance, I have found it difficult to find flours that come anywhere close to normal. It’s a difficult road following a gluten free lifestyle, but the relief was almost instant and I am truly thankful I now have a solution to a health problem I’ve suffered for years. Despite what the media say, gluten free is not a fad diet, it is a way of life, that has liberated me not only with my physical health, but also my mental health. It is really great to be able to discover new products on the market. Keep up the great work. I will definitely give this brand a try, Shauna. Your recommendations have been so helpful in the past. Is this Better Batter in any stores or just available online? I would love to find the perfect flour! My son and I have been gf for five years. We both had a myriad of symptoms, each of us different, that lead me to try going gf. We cannot go back to eating wheat, it makes us very sick. I was an avid baker before going gf. As time has gone by I have simply given up. I would love to try these mixes and use them to revisit some of my favorite recipes from before I needed to be gf. Thank you for extending yourself and producing something that those of us who are gf can really enjoy. What you do matters. I’d love to try these, rather than mixing my own blends, but are they available in Canada? I was diagnosed with Celiac last month after many many tests and being told I probably have lupus. So very thankful I can treat my disease with just changing my diet! My 5 year old asked the other day to make chocolate chip cookies with me and I had to tell her we can’t yet. So, I am so excited to try these products and tell my daughter we get to bake chocolate chip cookies!! I would love to try these mixes! I have heard before that Better Batter is a really good mix to recreate old recipes but haven’t had the money or time to try them out. I wish so much for a bagel or a peice of cake that it’s hard to stay committed to eating gluten free. These would be so awesome to try and create a little more normalcy in my life – and the kitchen. It has been one year to this week that I went GF. I am on the road to healing after 30 years of misdiagnosis, I have all but given up on baked treats. I have not heard of Better Batter and will be ordering it today! I can’t wait to try and recreate my great-grandmother’s pie crust! Thank you. Wow! Great story! I’ve had some terrible experiences with gluten free mixes so I make a couple of my own. Thanks for letting me know of a good one out there. If I won my family would be very happy to have breaded food back! I have tried many combinations and cannot find the true taste and texture I want, so I would love to have that again!! I had to go Gluten-Free a little over 2 years ago – its not as hard as I thought – especially because I have my health back – but I occassionally want something very good – Like Bread!!! Brownies would work in a pinch…….LOL! We make everything from scratch here including own flour mix. Sometimes it is so nice to just have a cup for cup replacement. We go heavy on whole grains, so often baked goods are not as light as the family may like, but I am not going to make another flour mix so these would be fantastic to have on hand. I was diagnosed with celiac disease in January. I’ve always loved baking and my first gluten free attempts were just sad. I discovered Better Batter flour and loved it. I haven’t tried any of the other products yet but would love to! My now 9 year old son was diagnosed with Celiac Disease a little over a year ago. I’ve been learning to cook and bake gluten free ever since. I love being able to create something for him that looks and tastes “normal”. I want delicious gluten free food to be a part of his every day life. I have tried many different gluten free flour blends but have not had the opportunity to try Better Batter products. I would love to test them out. I can’t wait to try this brand! I was diagnosed with a sensitivity to gluten (and corn and soy) a little over a month ago, and since then I’ve been looking for good food that won’t make me feel terrible inside. I’m a texture eater, so sandy cookies and gummy muffins don’t satisfy me. I would love to be chosen to sample these flour mixes because if they are as amazing as you say, I know that it will give me that satisfied smile that I have on my face whenever I find a great gluten free product. I would also share the food I make with this flour with my friends so they will finally believe me that gluten free doesn’t mean gross. I love baked goods but have never had the patience for mixing and weighing and basically being specific, which one often has to be when baking. Anything that simplifies the process sounds good to me! Would like to try this mix. Thanks. I’m still searching for a good AP flour substitute and would love to give these flours a try. I would love to try these mixes. It looks like I can’t buy them here in NC. So much has changed in the 11+ years I have been GF, I like to keep trying new mixes, products, recipes, etc. Good luck with your cookbook & congrats on the James Beard award and your new son! I am 3 weeks new to GF and I would love some cake or cookies or brownies right now. In a perfect world, I’d love to make all of my own flour mixes….however, that’s rarely the case. I haven’t had brownies in years and this would be perfect! So excited to have a new baking option. Really miss being able to bake and do my own food. This will be great! I’m still new to glutenfree eating and I need all the help I can get. I’d love to try this. I have two kids with celiac disease, we haven’t tried Better Batter products yet, but I would like to after reading about them. I would love to win a sample pack! Thanks for the give-away! These Better Batter mixes sound great! Would love the opportunity to try these products myself and share with my children. Thanks! I make my own GF flour,and sometimes it works, sometimes it doesn’t. I would love to find a commercial AP GF flour that would make baking easier for me. I’m so excited to see another new product out! This makes it so much easier to pick and chose deserts and be able to enjoy simple things. Everyone needs to eat cake! I have been reading Gluten-Girl and the Chef for over an year, but have never left a comment before. Naomi’s reason for starting Better Batter brought tears to my eyes and inspired me to write to you. I own a an organic cafe at Simon Fraser University in British Columbia, and consider myself to be a socially conscious entrepreneur like Naomi of Better Batter. For about 7 years I have been creating and adapting gluten and dairy free recipes for my customers. I am currently setting up a blog where I can share these recipes and eventually write a cookbook. It has occurred to me, as also with Shauna, that not everyone one enjoys mixing from scratch nor has the time so I have been searching out flour mixes that I can test and recommend. I would love to try the Better Batter with my recipes and report on the results. Thank you Shauna. Still learning about how to bake using gluten free products and would love the opportunity to try Better Batter! Oh, brownies, how I miss them! I would love to try a sample of their mix. I would like to try these with my family. I think there are some gluten issues with 2 of my grankids. My 13yr old and 11 yr old were diagnosed with Celiac 3 weeks apart. They have only been GFree for a week. My oldest had a rash on his elbows that led us to his diagnosis but no other symptoms. Our Dr decided to test my other 2 kids who had no symptoms and unfortunately my daughter has Celiac as well. They don’t understand why they can’t eat gluten when they don’t feel sick from it. I really need to show them that gluten free products can taste good. I haven’t been technically diagnosed with gluten sensitivity. My whole life I have had several autoimmune illnesses and digestive problems. I have had several tests over the years trying to diagnose the problem with no luck. The more I heard and read about gluten sensitivity the more I became convinced that this is the answer to my health problems. So I started paying attention to what I was eating and noticed that every time I ate bread I was getting extremely sick. So I would to try your products because I can’t seem to find anything that I like. Thanks so much. Just discovered your blog and new to the gluten free lifstyle. I’m starting a 30 day gluten free challenge of my own and your site is a great source of info for me, thank you!